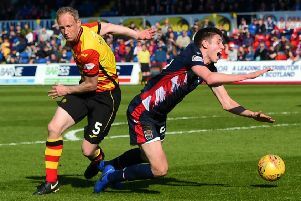 IT WAS a tale of two on-song former Rochdale strikers in Perth last night as Graham Cummins of St Johnstone and Ross County’s Craig Curran both took their tallies to three Premiership goals for the season in an evenly-matched encounter. The visitors were worthy of an interval lead given to them by Englishman Curran, who netted twice in last Saturday’s win at Hamilton Accies. However, Saints rallied well after the break and deserved the point they earned courtesy of an equaliser by Cummins, their summer signing from Exeter City. The result means the Perth side, for all their second-half promise, are still waiting for their first win of the season. Curran, who left Rochdale just a couple of months before Cummins arrived there in 2013, made an early impression on last night’s proceedings for all the wrong reasons when he was booked for a late tackle on Brad McKay with barely a minute on the clock. The visitors registered the first attempt on goal when Andrew Davies met a Michael Gardyne cross at the far post, but the captain’s goalbound header was beaten away by Alan Mannus. Cummins had been handed his first start after scoring as a substitute in each of Saints’ two previous league games, and the Irishman almost added to his tally when he headed narrowly over from a Liam Craig cross in the ninth minute. The same pair then combined again a minute later when Craig’s cross from the left was hooked towards goal on the half-volley by Cummins, from seven yards out, only for Scott Fox to get down and make a fine save. At the other end, Mannus was called into action in the 13th minute when he had to race from his line and save bravely at the feet of Jackson Irvine after the County midfielder had burst on to a ball over the top from Liam Boyce. Mannus from just inside the penalty box. Saints almost found a way back into the game in the 36th minute when John Sutton headed a David Wotherspoon corner goalwards, but Cummins inadvertently blocked his team-mate’s effort just in front of the goal-line before Craig rasped the rebound high over from 15 yards out. Rafa De Vita went agonisingly close to increasing County’s advantage in the 38th minute when he met a Gardyne cross six yards out, but McKay got in just enough of a challenge to divert the ball wide of the post. The Dingwall side threatened again four minutes before the interval when Ian McShane saw a low shot from the edge of the box saved by Mannus after a purposeful flowing build-up involving Boyce and Curran. Saints thought they had levelled in the 51st minute when O’Halloran sprinted down the right flank and cut the ball back for Cummins, but the striker’s close-range attempt took the slightest nick of Chris Robertson and came back off the inside of the post. He wasn’t to be denied for long, however. Just a minute later, the striker seized on a loose ball in the box after more good work by O’Halloran and drilled in a low, angled shot on the turn from eight yards out. County had a decent opportunity to restore their lead in the 66th minute after Mannus flapped at a long free-kick delivery by Marcus Fraser, but De Vita sliced his half-volley wide of the target from a good position just inside the box. St Johnstone: Mannus, Scobbie, Davidson, Wotherspoon (Lappin 74), Sutton (MacLean 84), Shaughnessy, McKay, Cummins (Kane 74), Easton, Craig, O’Halloran. Subs not used: Clark, Mackay, Caddis, Brown. Ross County: Fox, Fraser, Robertson, Davies, Foster, Gardyne, Irvine, McShane (Quinn 85), De Vita (Dingwall 69), Curran, Boyce (Graham 77). Subs not used: Bachmann, Holden, Murdoch, Franks.